SHAWN…THIS ONE’S FOR YOU BUDDY! Today it is 366 days since Shawn C McCafferty hit the ground running here at Doorstep Dairy! 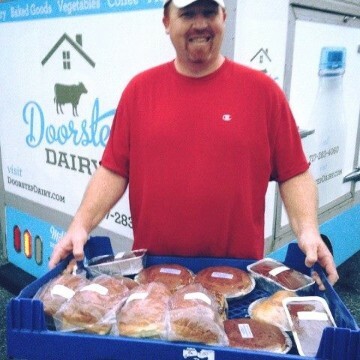 Shawn and his family had been long time customers of Doorstep Dairy. A year ago we found ourselves in dire need of a delivery person. Shawn answered our help wanted add and after 2 short weeks of training he was on his own. With years of route delivery experience under his belt he was confident he could be a milkman. For the past 52 weeks he has arrived on time and been willing to do what it take to get the job done. One experience that we still look back on and laugh about. We have a Friday route that was not completely full when he started. Meaning it was a shorter day for Shawn. He was okay with that … but over time it continued to grow. It got a bit ridiculous. It grew to the point that Shawn started leaving an hour early. He would arrive at 5:00 AM and load his truck. And I mean load the truck…there was no extra space for anything. Then he would go to the bakery and stack the passenger seat with trays of baked goods. He would spend a good 14 hours every Friday making sure everyone received their delivery. This lasted for several weeks until we were able to assign a portion of the route to another driver. A common question I hear from Shawn. About a year ago we we began looking for a place to relocate our business. For 5 years we had been working out of our home, garage, and drive way. Things were getting pretty crowded. Turns out Shawn has a few connections when it comes to property too. We followed a lead Shawn gave us and BOOM…ended up moving into a warehouse space last December. Now we can load and park our trucks inside out of the weather, we have a ‘real’ office instead of a converted bedroom, lots of cold storage, and extra space for a pet boa….if we decide to go down that road. All in all Shawn’s a pretty good guy to have in your corner! Shawn is an avid sky diver, fly fisher, and loves the opera. He loves the Eagles and Phil’s and his sons Tee Ball team. Thanks for all your hard work Shawn!